Children's books are about the right level for me when it comes to reading in German. Even with no familiarity with the story, I read Geheimnis Am Holunderweg without using the dictionary once, and it seems to be aimed at preteens or young teens. For purposes of improving my German, reading this book was light years more helpful than my recent slog through Kafka, in which I had to look up every other word, which caused me to frequently lose the author's train of thought. There were plenty of words in this book that I didn't know, but the simple sentence structure and story line made it easy to figure out meanings from context, without slowing down. The edition I read was printed in 1970, and set in a small German town. (Holunderweg is the name of a street, and the title translates as The Secret of Holunderweg.) 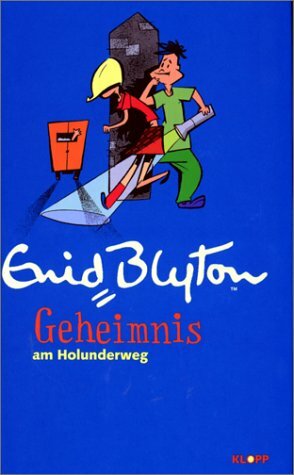 I initially assumed that this was a translation of a work by the famous English children's author Enid Blyton, but the German setting made me wonder, and so I did some googling. Although I couldn't find any reference to this title in particular, apparently there were many books, and series of books, written by French and German authors in Blyton's style and using her name, either with or without permission. This would seem to be one of those. In the course of my googling I also learned that many of Blyton's books were full of racial and gender stereotyping and later editions were usually edited to remove insulting references to blacks. And apparently in many of her books in which groups of children had adventures and solved mysteries, girl characters were excluded from the more dangerous events, and always did the cooking/cleaning up for the boys. This issue did come up in Geheimnis Am Holunderweg. At one point the oldest boy tells the two girls that they may not come along on a midnight search for some stolen goods because it would be too dangerous for them, and the girls willingly comply. I don't know which seemed more anachronistic to me--girls happily taking orders from boys, or twelve-year-olds running all over town unsupervised day and night rather than being driven to activities and play dates by their parents! I will look for Ende and Frisch--thank you so much for the suggestions! I'm always looking for the right book to read that would be in that "sweet spot" of challenging, but not prohibitively difficult. Since Amazon is my main source of German language books, it's always a guessing game. By the way, I was trying to remember where I'd heard of Joseph Roth. I did come across him on Amazon some time back; he was an amazing journalist in Weimar Germany who observed the country just before and after the beginning of the Nazi regime, and predicted with chilling accuracy the horrors that the Nazis would bring. He died of alcohol abuse in 1939. I haven't been able to find any affordable copies of his works in German, unfortunately, though I've got the English translations on my Amazon wish list. Isn't it just wonderful to "breeze" through a book in German after the long hard work on Kafka? It is an advantage to start with an established classic writer ( momentarily reading Flaubert) because other books seem so easy in comparison! You found some great trivia about the writers style while google-ing. That makes your review so interesting. I discovered while google-ing the Hitler regime, that Hitler's government demanded that every German school teach the Brothers Grimms' books(tales)! The villian is a woman, doing violance against girls and the girl seldom resists ( Ravensbruck). Snow White is an example: the heroine is hunted by the terrible queen-stepmother, does nothing to save herself and finally with utter passivity is immobilized in a glass coffin waiting for her prince to come! Hitler just loved this concept! Good grief--the Grimm brothers must be turning in their graves! You're absolutely right about the "good girls" being passive and helpless to the point of immobilization, and the powerful women always being villains in those stories. One could come up with dozens of examples. I never realized that Hitler made overt use of it, though. Wow.